Home / 1 Corinthians 1:27 / 1 John / 1 John 3:23 / Gospel / How to be Saved / James 2:19 / Jesus is Lord / John 3:1-21 / John 6:28-29 / Mark 1:15 / Romans 10:9 / Salvation / The Essence of the Christian Confession / What is the Essence of the Christian Confession? Jesus is Lord! What is the Essence of the Christian Confession? Jesus is Lord! What is the essence of the Christian confession? Have you ever thought about it? What is it that you need to actually say and do to be saved? These questions have perplexed many because of the complexity of our confession and yet at the same time others have found much joy and hope in the simplicity of the Christian confession. Paul echoes these feelings in 1 Corinthians 1:27 saying, “God chose what is foolish in the world to shame the wise; God chose what is weak in the world to shame the strong.” Sometimes the more we learn about our confession leads to confusion and doubt as we loose sight of the simplicity of our confession. Other times a focus on the simplicity of our confession will miss the glory and grandeur of everything that is encapsulated in the Christian confession. So what is the essence of the Christian confession? Romans 10:9 seems to be the surest guide to the simplicity of the Christian confession saying, “…if you confess with your mouth that Jesus is Lord and believe in your heart that God raised Him from the dead, you will be saved.” The Christian confession has two parts, one, confess with your mouth, and two, believe in your heart. The content of this confession is a belief that Jesus is who He says He is, Lord, and that God raised Him from the dead. The result is that you will be saved. Our confession is so simple and yet some will raise objections citing James 2:19 saying, “Even the demons believe and they aren’t saved. What’s the difference?” The difference comes in the evidence of belief. Part of the beauty of the book of James is that it is demonstrating what a Christian life looks like. James is arguing that there is an implicit lifestyle that flows out of the simple confession of Christ. Yes, the demons believe, yet they do not submit their lives to that belief. Instead they choose to live their lives in complete rebellion to the Son and the Father. The Christian believes that Jesus is Lord and that belief is shown through a life striving to be dedicated and submitted to that one truth. John echoes this same line of thinking in his gospel and in 1 John. John’s whole testimony, and that of the apostles, is a confession of Christ being manifest in the world (1 John 1:2-4). In 1 John 3:23 he tells us, “…this is His commandment, that we believe in the name of His Son Jesus Christ and love one another, just as He has commanded us.” John is probably referencing Jesus’ words as recorded in his own Gospel, John 6:28-29, where Jesus is asked, “What must we do, to be doing the works of God?” to which Jesus replies, “This is the work of God, that you believe in Him whom He has sent.” This same confession is also seen being worked out between Jesus and Nicodemus in John 3:1-21. Jesus’ statement in Mark 1:15 is also seen as an important clue to the essence of our Christian confession. Here Jesus says, “The time is fulfilled, and the kingdom of God is at hand; repent and believe in the gospel.” At first glance this may seem to be different than what I have laid out above, yet the essence of the confession is the same. The time has been fulfilled because the coming Messiah of the Old Testament has entered our world. The kingdom of God is at hand because the one who was to come in the line of David is here in flesh and blood, Jesus. Jesus is to be the righteous King that will reestablish God’s kingdom amidst man’s rebellion. To be apart of Christ’s kingdom one must repent of their rebellion and believe the gospel. The essence of this gospel is a confession that Jesus is exactly who He says He is, God incarnate, Lord. The outflow of this confession is a life submitted to the King. 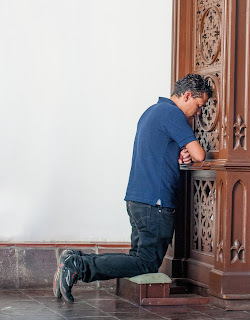 If we can grasp the simple essence of our confession the rest naturally falls into place. If you have confessed with your mouth that Jesus is Lord and believe that God has raised Him from the dead, you will be saved; and your life will reflect this one truth. If we believe Jesus is Lord then we want to follow his commandments (John 14:15). If we believe Jesus is Lord, we will love those that love Him (1 John 4:20-21. If we love Him we will confess our sin and strive for holiness. If we love Him and confess that He is the Son of God, God will abide in us (1 John 4:15-16). Ultimately, if we confess and love Christ we have no fear in judgment (1 John 4:17-19) and joy in this life growing to completion in the next (1 John 1:4). The essence of the Christian confession is simple: Jesus is Lord! The outworking of that confession is complex and grand in life after life living under the banner of this one truth.